The company that brought us one of the original modern pre-workouts in N.O. Xplode and one of the first ever truly delicious-tasting whey proteins in Syntha-6, BSN is taking a step forward and is re-branding from the standard BSN look we have seen over the last fifteen years! On the branding front, BSN is sticking with their slick red and silver, the company is adapting with a new modern look across its labels. Fans of the current Syntha-6 can sleep easy knowing that the formula isn’t changing, just the packaging! The classic BSN is putting a new twist on its branding! You can check out BSN’s YouTube video unveiling the new look here! In response to claims that the rebrand is simply a “label change”, BSN was quick to let its followers know that this “is just the beginning.” Fast forward a couple of weeks, and the company delivered on its promise, dropping the news for its new line of its Syntha-6 whey protein. We haven’t had a chance to try it since it released yesterday, but the Cold Stone edition promises to deliver an authentic Cold Stone taste! The news that seems to be most exciting to BSN fans, is the new ice cream inspired flavors of protein. In addition to giving its products a new face lift for its customer, the company also made waves by announcing its new Cold Stone Creamery line of Syntha-6 whey flavors. Protein Ice Cream, anyone? Blackstone Labs brought it cold, but now you can get it in a powder! 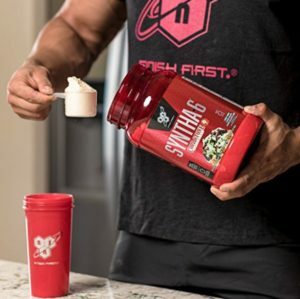 Stealing a page from Ghost Lifestyle‘s playbook and driving a true business partnership (they’re partnered with WARHEADS Candy for flavors of their Ghost LEGEND pre workout and Ghost SIZE muscle builder), Glanbia-owned BSN has taken it another level with their popular Syntha-6 protein powder, by partnering with Cold Stone Creamery for some real-deal ice cream flavored protein! The Cold Stone logo imprinted on the label shows that the two companies have officially worked out a partnership, allowing BSN to use the name — and assuming Cold Stone Creamery approved of the flavors, so we can almost guarantee this is going to taste amazing… especially knowing Syntha-6’s not-so-clean-but-so-delicious flavor profiles already out there! We know that the Cold Stone edition is being shown in three flavors that we know of. The Birthday Cake Swirl is described as decadent combination of Cake Batter, Brownie and Fudge flavors mixed with real Cookie Bits and Rainbow Sprinkles – all packed with the ultra-premium BSN protein complex. Amazon is the only place that currently has the product and only the Birthday Cake Swirl is available. The other two flavors are Germanchokolatekake and Mint Mint Chocolate Chocolate, which bring up great ice cream shop memories as well. Syntha-6 made our top three list of proteins for “best tasting and most creative protein.” If you’re looking to find the best protein for you, check out our PricePlow protein guide and rankings, here! Well, yes and no. We all know Syntha-6 has a higher than average calorie content, with more of those coming from carbs (most of which are sugars) and fat than your average protein powder. 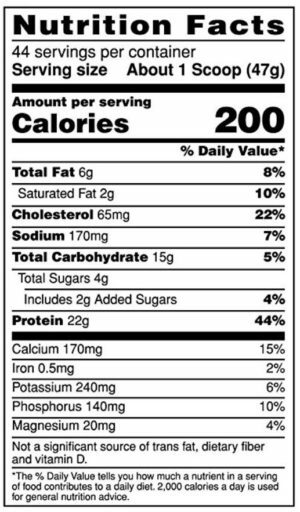 Using an ice cream parlor’s flavoring, we would venture to guess that these macros might even be worse. However, that might not be the case. Ice cream flavors with no ice cream macros? Yes, please! Each four and a half pound tub comes with forty-four servings, at forty-seven grams per scoop. Needless to say, this isn’t the cleanest protein around but for those who don’t care about the nutritional aspect of their protein, we can assume this will deliver big in the taste department. With the newest additions, BSN is showing the world that it can still keep pace with the vastly creative supplement market. No word yet on what else the company may have in store but the company has made two huge waves in the news this month alone. If the company’s statements are true and this is “just the beginning” then we can expect some other cool drops from BSN in the near future! 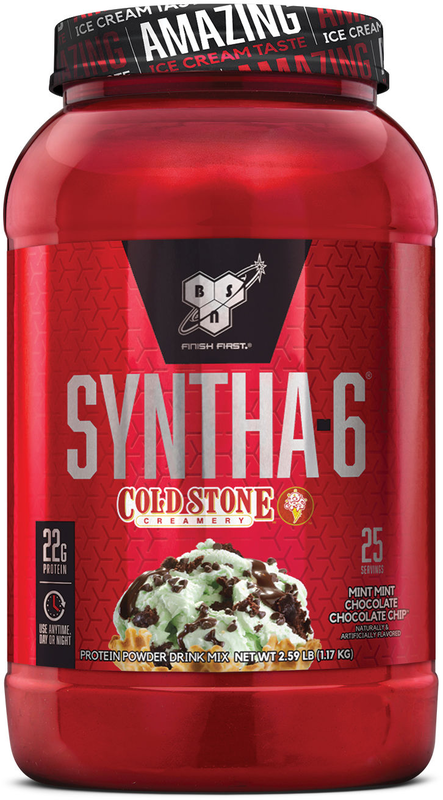 Which BSN Syntha-6 Cold Stone edition protein do you want to try? Let us know in the comments! Looking for the best deals on BSN supplements? Don’t forget to use the PricePlow price tool to get the best deal possible! Comments | Posted in Supplement Industry News, Supplement News | Tagged BSN, Cold Stone Creamery, Glanbia, Ice Cream, Protein Ice Cream, Protein Powder, Whey Protein.